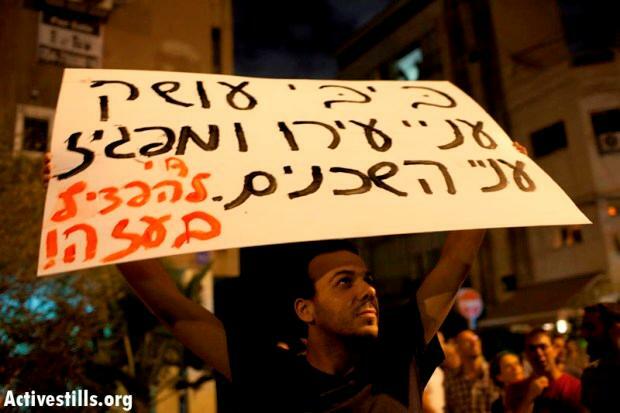 In the article on the ‘social justice’ movement in Israel we published on 7 August , we wrote that “numerous demonstrators have expressed their frustration with the way the incessant refrain of ‘security’ and of the ‘threat of terrorism’ is used to make people put up with growing economic and social misery. Some have openly warned of the danger that the government could provoke military clashes or even a new war to restore ‘national unity’ and split the protest movement”. These fears proved to be well-grounded. On 18 August, there was a spate of armed attacks on Israeli civilians and military patrols. Two public transport buses in southern Israel were raked with gunfire, leaving several dead and wounded. There was some confusion as to whether the Popular Resistance Committees or Hamas carried out these attacks: neither claimed responsibility. Either way, the Israeli government responded in its characteristically brutal manner, with air strikes in Gaza that killed members of the PRC but also children and a group of Egyptian border guards. This in turn provoked further rocket attacks launched from Gaza on southern Israeli towns. Whoever initiated this latest spiral of violence, an increase in war tensions can only benefit the nationalists on both sides of the Israel-Arab conflict. It will create major difficulties for the development of the protest movement and will make many hesitate about continuing with the tent cities and demonstrations at a time when there is enormous pressure to maintain ‘national unity’. Calls to cancel the protests came from the like of National Union of Students leader Itzik Shmuli, but a significant core of the protestors rejected this call. On the night of Saturday 20 August demonstrations went ahead although they were to be ‘muted’, and were on a far smaller scale than in previous weeks. The same was true for the demonstrations on Saturday 27 August. The fact that these slogans and sentiments should become so much more popular than they were only a year or two ago indicates that something profound is happening in Israel, and especially among the younger generation. We have seen comparable glimmerings of youthful protest against the Islamic status quo in Gaza. As in Israel, the ‘Gaza youth’ are a small minority and they are weighed down with all kinds of illusions – in particular, Palestinian nationalism. But in a global context of mounting revolt against the existing order, the foundations are being laid for the development of a genuine internationalism based on the class struggle and the perspective of an authentic revolution of the exploited. Capitalism in meltdown: is there a working class response?